Codemaster V has required an increasing amount of technical support for installation in recent years, but the introduction of Windows 7 has made it unsustainable. To run Codemaster under Windows 7, it is necessary to install the Windows Virtual Machine running Windows XP(!). Microsoft giives you the virtual machine and XP operating system free of charge, and even suggests it as a means of running older games and other programs. To me, that says a lot more about Windows 7 than it does about Codemaster. It's like taking delivery of a new car and the dealer points out that there is a free bicycle in the trunk! 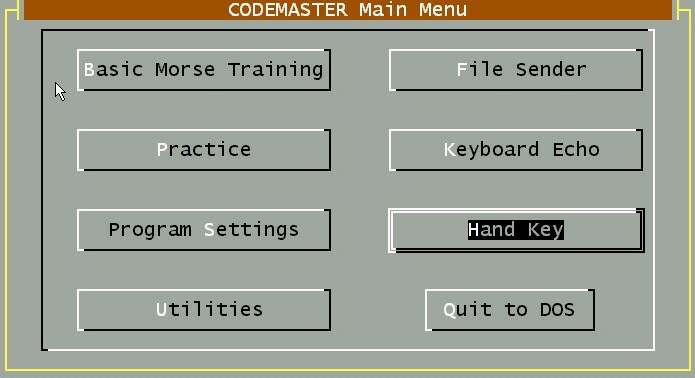 I think Codemaster is worth saving, because the basic Morse training method allowed me to guarantee meaningful results, and a number of special features made it unique. For example, the speed could be calibrated accurately to either PARIS or CODEX (military) standards, and it was very easy to create non-English/ITU Morse characters, so you could use it for practice with European and Asian Morse code variants. That's why it was originally endorsed for military Morse training, and it is still the only code training program with those capabilities. . I also have a huge sentimental attachment to the program. The kernel of the method was encoded (program written) in 1983 to help a friend pass a Morse examination. It worked so well, and my friend praised it so highly, that "by popular demand" I had to develop it out to a commercial quality product. I sold it through Tandy (Radio Shack) in Australia, and that was the start of Milestone Technologies all those years ago. We still have the AMECO Morse training courses which have successfully trained thousands of operators and hobbyists since the 1950s. Not as efficient or flexible as CODEMASTER, certainly, but in fact very similar to the method I myself used to learn Morse code, many years before CODEMASTER was a twinkle in my eye. If you want to learn Morse code, method is always secondary to motivation. Whatever method you use, I wish you every success, and hope to meet you on the bands one day. 0-20 WPM in 90 days, Guaranteed! CODEMASTER V has a world-wide reputation as THE Morse code training package for either the newcomer to Morse code, or the experienced user who wants to improve his or her receiving skills. Successfully used by thousands of amateur radio operators around the world, CODEMASTER has been endorsed as suitable for military Morse training. If you're a beginner, CODEMASTER teaches Morse in a structured learning environment based on years of experience in formal Morse training and reflecting the most beneficial aspects of computer aided instruction. CODEMASTER V can virtually eliminate the "plateau effect" and if you already know the code, CODEMASTER will take you as far as you want to go. If you have already learned the code, or achieved a minimal level of competence with CODEMASTER's basic Morse trainer, the flexible practice system is an easy and efficient way to improve your code copying proficiency-- all the way up to 40 words per minute or more. Time-tested methods ensure that progression to higher speeds is as painless as possible. identify characters you're having trouble with. Think you can learn Morse by hypnosis, or in your sleep, or with gimmicks? Guess again. We wish it were that easy, and we wish some people would be a little more ethical about their claims. Not only are you unlikely to learn the code, the odds are pretty good you will end up with some bad habits that make it even more difficult to learn Morse later. Next time you're tempted by one of those catchy ads, look for the guarantee. We put our money where our mouth is! CODEMASTER V is the only Morse training system that guarantees results, and that is because it is the only system that has been proven to work with anyone of any age. on our 0-20wpm in 90 days claim? There isn't any. At the bottom of this page are some screen shots from CODEMASTER V..